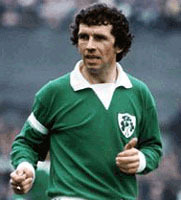 Johnny Giles is Ireland’s greatest footballer. His brilliance both as a player and as a footballing intellectual ensures this remains unchallenged. It was in Ormond Square near Dublin city centre and subsequently in the Navan Road area where the youngster was to hone his skills and receive his footballing values. His dad, a former league of Ireland player and manager with Drumcondra, was an important influence. Giles junior was essentially a footballing product of the street. This was an era when endless games of street football continued well after dark and helped shape the type of player he became. He was unbridled by the sterile tactics and rigid formations imposed on young players by many academy coaches today. There were no computer games, no social media, just a ball with jumpers for goalposts, imagination and the chance to express that innate ability against your pals in the street. Out of this milieu would emerge many footballers in Ireland, Britain and worldwide who went on to make a living from the game including the relatively obscure but underrated player that was Eamon Dunphy. This is a treatise of John Giles, both as player and football analyst. In the former his immense contribution on the pitch was laced with a rare intelligence, in the latter he continues to provide Irish television viewers with unequalled footballing insight in a world largely occupied by pundits offering nothing but platitudes. 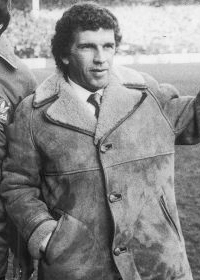 It is probably the case that younger Irish fans only view Johnny Giles within the prism of football analysis but Giles was a footballing giant despite his 5 ft 7 in stature. It continues to annoy Giles when people insinuate that a lack of height prevents a player from competing at the highest level. He describes himself as a player that was short rather than small. This in fact brought many advantages, none more so than helping to mitigate clod hopping midfielders’ intent on destruction rather than creation. You only to have to look at the recent Barcelona wonder team which included the diminutive quartet of Iniesta, Xavi, Messi, and Villa. All four of these players might be considered short on height but whose effectiveness is near infinite by virtue of their creativity. An Irish contemporary, Giles argues, is Wes Hoolahan or perhaps the hereto unknown Jack Byrne who is relatively short but already looking a fantastic midfielder with guile and imagination and surely not far off senior international involvement. 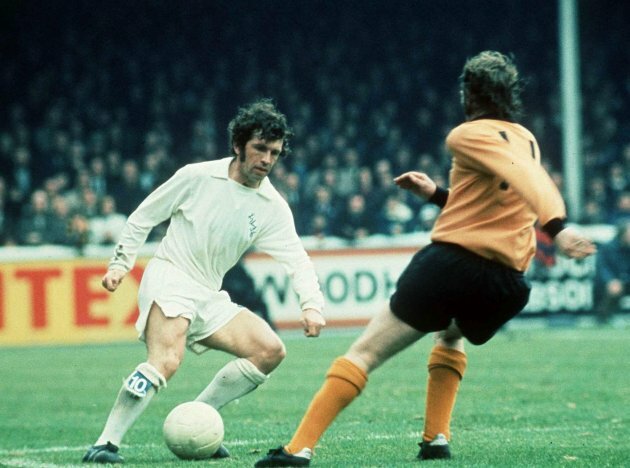 Many older Irish fans exalt Giles as one of the greats probably because of his Leeds United performances in the brilliant sides of the 60’s and 70’s as much as his involvement with the Irish team. Leeds United retain a very large support in this country today due to a burgeoning television ownership in the 1960’s which provided a window into Giles huge influence on the Don Revie managed teams. An indicator of Giles importance at this time can be gauged by the little known fact that there was even a ditty recorded in his honour. Unfortunately Giles success with Leeds coincided with lean times at international level with the Irish team failing to qualify for any international tournament. In fact, one needs to remember that Giles was in a fine Irish team that very nearly qualified for European competition had it not been for a close defeat to Spain in Paris in 1965 with Eamon Dunphy also contributing. 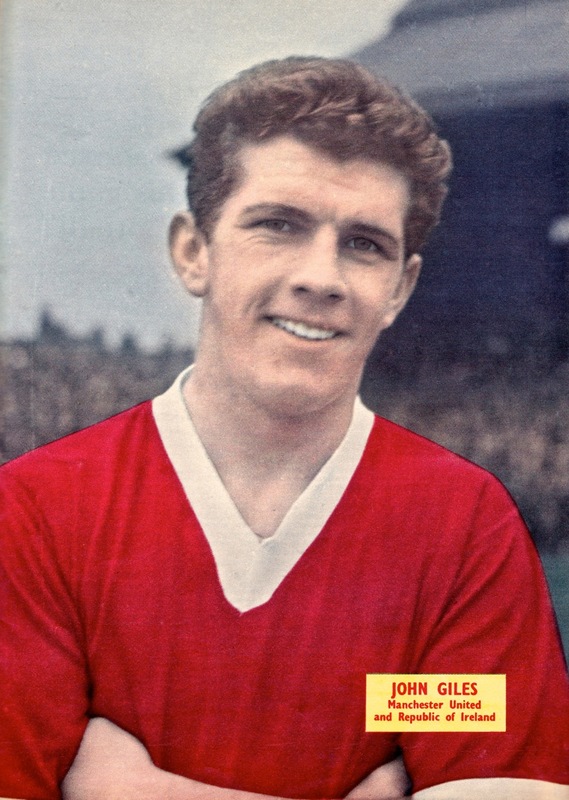 Times were certainly different when Giles began his senior international career in 1959. It was a committee of FAI officials, rather than the manager, that held sway when it came to team selection. Despite the repressive nature of this archaic football structure, for Giles – he like others only found out that he was called up for his first cap by chance after reading it in a newspaper – “the dream was football”. He had been part of Manchester United’s youth team and was heading into the reserves/first team at this stage but the call up to play for Ireland represented the pinnacle of his career to date and perhaps ever. Moreover, the chance to experience “the Dalymount Roar” as a player, something which he as a youngster had contributed to from the stands was a dream come true. Giles started the game as inside forward against a Swedish team who had the year previously lost the World Cup final to a Pele inspired Brazil. Sweden had also beaten England at Wembley the previous Wednesday so formidable opposition awaited the Boys in Green. Ireland ran out 3-2 winners on the night after going two down, with the fightback beginning when a thirty-yard screamer from debutant Johnny Giles hit the back of the net. 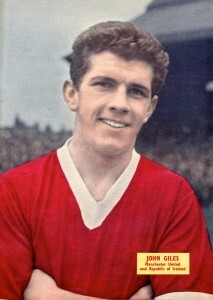 Giles returned to a damp Manchester and would spend four more years at United culminating in a 1963 FA Cup final appearance before being sold off to second division Leeds United. His career really took off from that point, with Matt Busby later commenting that one of his regrets in football was selling Johnny. Giles promised his wife at the time that he would come back to “haunt” Busby. Leeds with Don Revie at the helm went through a golden period and with Giles in their side they immediately won the second division, following it up with the first division championship. FA Cups and glorious campaigns in European competition were also to be the order of the day. The days of Giles and his accomplice Billy Bremner in the Leeds midfield are truly memorable. Their midfield play was both creative and superbly effective and is an excellent paradigm of good attacking football. In Giles’s 2010 autobiography he attributed the symmetry between Bremner and himself to the point of, “We weren’t trying to hold, we were trying to play. It was about getting the right balance”. As they both scored exactly 115 goals each at the club then how much more proof do you need for Giles theory. The football world’s appreciation of Giles intelligence was further expressed by a desire to see him go into management. This became reality when he became the Irish international player-manager in 1974 and not before fellow Leeds players had forwarded his candidacy as manager when Don Revie left to take the England job. Gone were the days of the selection committee in the Ireland setup so Giles was allowed to pick who he wanted for his Irish team. His first competitive game as manager is one of the most fondly remembered match in Ireland’s footballing history. The European qualifier at Dalymount Park against the USSR in 1974 saw Giles as captain/manager take to the pitch with the youthful Liam Brady by his side. Everyone from those sitting dangerously on the barn like galvanised roofed stand behind one of the goals to those wedged sardine like in the actual stands helped amplify the Dalymount roar to perhaps its greatest level ever. Giles had picked the heretofore impotent striker Don Givens to lead the attack. Givens was lucky to be even alive in fact. Prior to the match Giles had taken an Irish team on tour to South America. Ireland performed magnificently – on sparse resources – under Giles stewardship, particularly in the match against world champions Brazil in a packed Maracanã. The Brazilians were so impressed by Giles team’s style of play that he was chosen as the Brazilian Football Federation’s special guest at the following World Cup finals in Germany. In the days before the Maracanã match Givens went for a swim at Copacabana but got into serious trouble only for big goalkeeper Mick Kearns to save him from an almost certain drowning. The confidence placed in Givens paid dividends with the striker scoring a superb hat-trick, much of that due to the midfield brilliance of the mercurial Brady and the master Giles. The match is an excellent case study of good midfield play. Giles involvement in Givens opening goal is seminal. Dropping off from midfield and opening his body up he receives the ball from defender Paddy Mulligan, lifts his head and pings an arrow straight ball out wide right to Joe Kinnear. Giles imagination completely changes the positional landscape allowing Kinnear time to measure a perfect cross for Givens to score a Roy of the Rovers like diving header; the crowd behind the goal going absolutely wild with delight. Giles international teams performed well and narrowly missed qualifying for the European championships in 1976. So narrow in fact that coming closely second was not even enough at this time as only the top team could qualify. This may explain Giles characteristic bemusement recently at those insisting that getting a play-off was fine even before we went into the game with Poland in the current qualifiers. This after guaranteeing that position after the famous win against German at the Aviva. Giles was asking why we are not positive and don’t actually go out to try and beat Poland. So what if it’s away and not at home, it’s still a good pitch to play on with eleven against eleven! Giles, Dunphy and Ray Treacy at Rovers. Giles finished as Ireland manager in 1980 and it’s probably only today that we can fully appreciate what he was trying to do especially with what came after him on the Irish managerial front. His philosophy was later taken to other footballing projects in North America and in Britain with West Bromwich Albion. While at West Brom the team went from the second to the first division, finishing 7th place in the top division while playing attractive football. Let’s not forget of course that spell in the League of Ireland with Shamrock Rovers after finishing with West Brom. 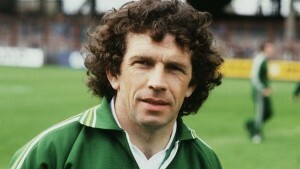 With Eamon Dunphy at his side, once again, “the dream was football”. A depressed and regressive footballing landscape proved to conspire against the project however. From his position in the RTE football studio Dunphy would lure Giles to Donnybrook, where he would develop into the analyst extraordinaire. Giles in his recent book “The Great and the Good” and in his television analysis suggests that successful football emanates from a philosophy that allows players to play and express themselves. The focus from a coach’s perspective should be on good touch, passing ability, awareness and imagination. This creates the football spectacle where mesmerising passing movements occur as a result of time and space being created. Successful teams make sure this is matched by a collective desire to win the ball back quickly when possession is lost. As Giles puts it “This is the game that we learned in the streets. This is the game that we love”. While Giles may jokingly say that poverty produces great footballers he believes that Pep Guardiola’s Barcelona have helped spread a true football philosophy. The latter’s team have been wonderfully successful by actually playing football that is aesthetically pleasing but proven to be extremely effective. Their destruction of a good Manchester United side in the Champions League final at Wembley in 2011 is testament to this. Watching Ireland’s performances in the current European championships it makes Giles case that teams can actually win by trying to keep possession and build the play up rather than banging it up to a beleaguered front man. Football is a simple game and Giles brilliance as a football analyst is that his analysis is simple, “Either you have the ball or you don’t have it. When you don’t have it everyone is obliged to make an honest attempt to win it back”. One of the constant themes of Giles analysis over the years, with unwavering Dunphy support it must be said, has been the belief that huge gains can be made by playing through midfield rather than route one. The theme has been prompted by the obvious lack of change in playing style by Martin O’Neill from Giovanni Trapattoni’s tenures. The in and out selection practice with regard to Wes Hoolahan mimicks to a degree the non-inclusion of Andy Reid in Trappatoni teams. A clear parallel in both policies continues, it seems, to jeopardise our chances of qualifying for tournaments. As Giles points out; Hendrick, McCarthy and Whelan seem to replicate each other in midfield as much by instinct as by instruction. Giles has on countless occasions pointed to the stymied effect this has on keeping possession and moving up the pitch. Giles extrapolation of evidence of footballing ineptitude from matchplay footage is equally matched by his ability to pinpoint footballing positives from footage that less discerning viewers completely miss. These tend to be game changing moments such as the dummy run that takes away a defender for a player to run through the defence and score or a simple pass in midfield that changed the landscape for the player in receipt of the ball to set up another attack. Wes Hoolahan’s retention of the ball in that spectacular win against Germany in the Aviva recently is a good case in point and was duly highlighted by Giles. 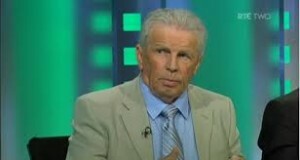 John Giles is an Irish footballing treasure. His seamless transition from brilliant footballer to equally brilliant analyst has assured of him this. A freeman of his home city, conferred with an honorary doctorate by Dublin University and recognition by the FAI of his status as the greatest Irish footballer of the last 50 years has not changed what is an essentially humble man who emerged from the impoverished but enriching streets of his youth. The playing down of his role in the now immortal game where Leeds hammered Southampton 7-nil in a 1st Division game in 1972 is typical of the man. Beating a team into submission and showboating as he put it lacked “the real enjoyment that came from playing in a game that was really tight, where you had to perform under pressure, doing your stuff at the height of the battle and helping to turn the game in your team’s favour”. He remains the leading authority on football in this country and is hugely respected beyond.